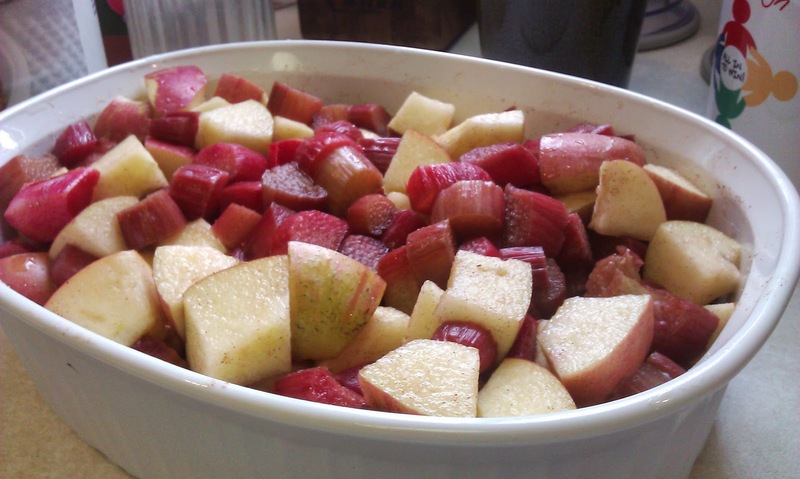 It's Spring, which means Rhubarb! If you're lucky enough to know somebody who has some - and even luckier to have someone willing to go cut it for you. Oh, I would definitely go cut my own rhubarb because I love it, but my friend Peggy lives closer to our friend Alice than I do, so she gets me some when she gets hers. I use it in muffins, rhubarb bread, this Rhubarb Pudding Cake that I adore, and pretty much anything else I can think of. 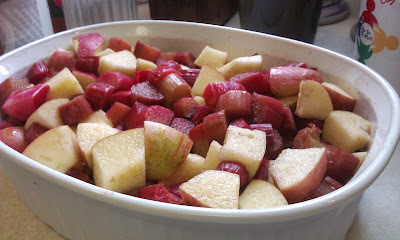 And I freeze lots of it so I can have rhubarb throughout the year. Today I was thinking Rhubarb Apple Crisp, so I went looking for recipes - as if I don't already have plenty of my own recipes - like that pudding cake that I'm now wishing I'd remembered and made. 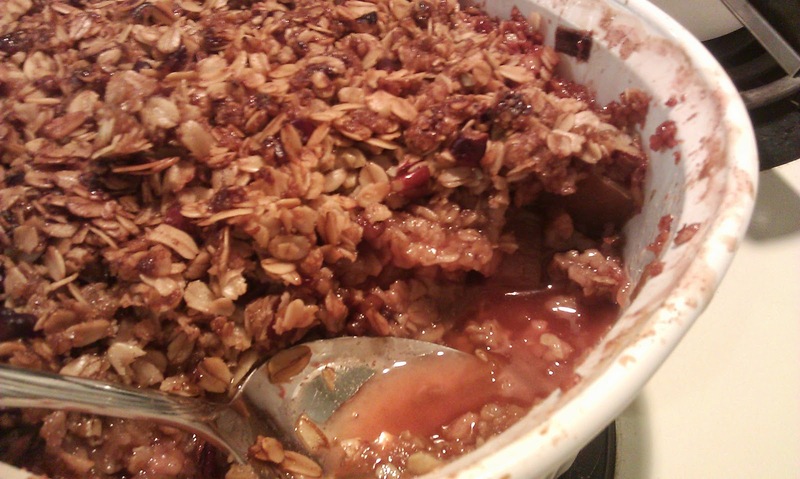 But anyway, I found this one for Apple-Rhubarb Crisp that looked pretty good, so I started there. But I wanted a different topping, because my friend Peggy, who cuts the rhubarb, doesn't eat wheat, and I wanted to avoid using flour. That's when I found the Apple Cranberry Crisp recipe in my favorite cookbook ever - The Best of Mennonite Fellowship Meals - and I had a note right there in the cookbook that the recipe is also good with rhubarb and apples, as well as a modified topping recipe - without flour. So I used the basic idea of the recipe I'd looked up - because I liked the idea of the juice mixed in with the fruit - with the topping I had written in the cookbook. 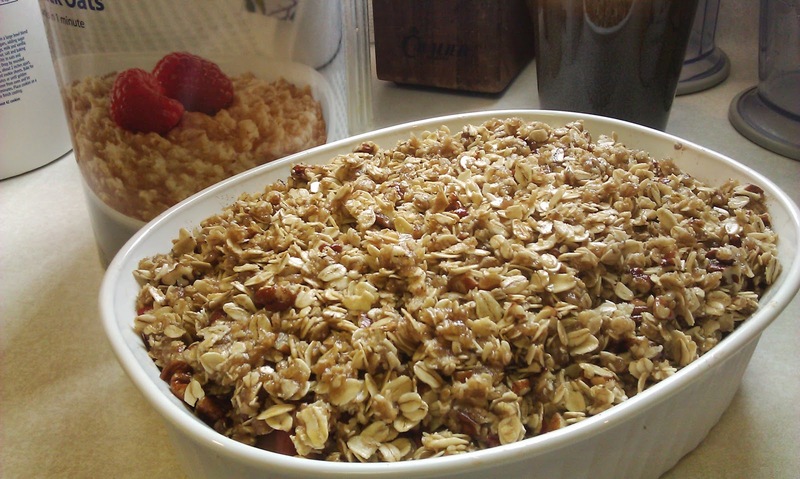 Mix topping ingredients - melted butter, brown sugar, oats, and pecans - until crumbly, and spread evenly over fruit. Bake at 350° for 1 hour or until fruit is tender and bubbly and topping is browned. It's time again for Secret Recipe Club (Secret Recipe Club) reveal! This month I got to choose a recipe from Beth's blog It's Good To Be The Cook. Beth lives outside Philadelphia, loves her family, her wonderful (and cute) boyfriend Dave, and her dog Stella. Her posts are so much fun to read. They're not just about the food - though the food is definitely front and center with recipes and loads of mouth-watering pictures. So I started looking at the recipes - Oh, Beth! So many great recipes. How am I supposed to choose? I love all the spicy stuff and that there's spinach in practically everything. OK, maybe not everything, but a lot. It looks like she's almost as obsessed with fresh spinach as I am. I love it in practically everything! Also, she has all her clipped and saved recipes organized in a binder - something I've thought about/wanted to do for ages, and never got around to it. Yep, I still have boxes of magazine and newspaper clippings, recipes I wanted to try but may never find again. I'm kinda jealous of her organizational skills. 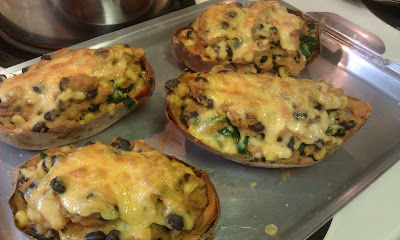 Anyway, I started looking through the recipes, and I wanted to try the Buffalo Chicken Soup, the Black & White Bean Quesadillas w/ Avocado Ranch Dip, the Buffalo Chicken Stuffed Baked Potato, the Chicken and Bean Burritos, and several more, but I finally decided on these Tex-Mex Stuffed Sweet Potatoes. And it was a very good decision. These things are yummy!!! Preheat oven to 350°. Wash potatoes and pierce a few holes or slices in the top. 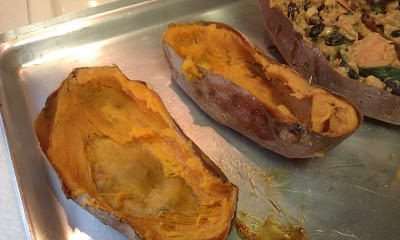 Pat dry and place on foil or a baking sheet in the oven for 1 hour and 20 minutes, checking at the 1 hour mark. They will be cooked when they can be easily pierced with a fork. Set aside while you prepare the filling. Heat the oil in a large skillet on medium high. Add the onions and saute for 3 minutes then add the garlic, jalapeno and mushrooms and saute another 3 minutes or so. 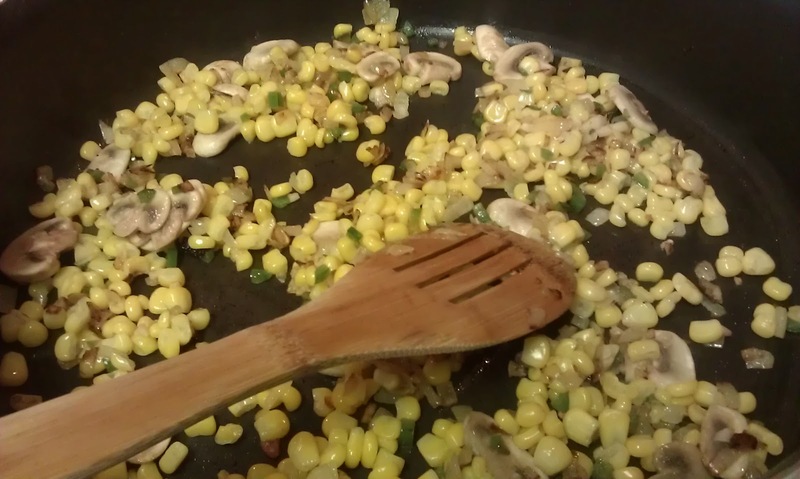 Now, add the corn and saute for another 3 minutes and then stir in the seasonings. 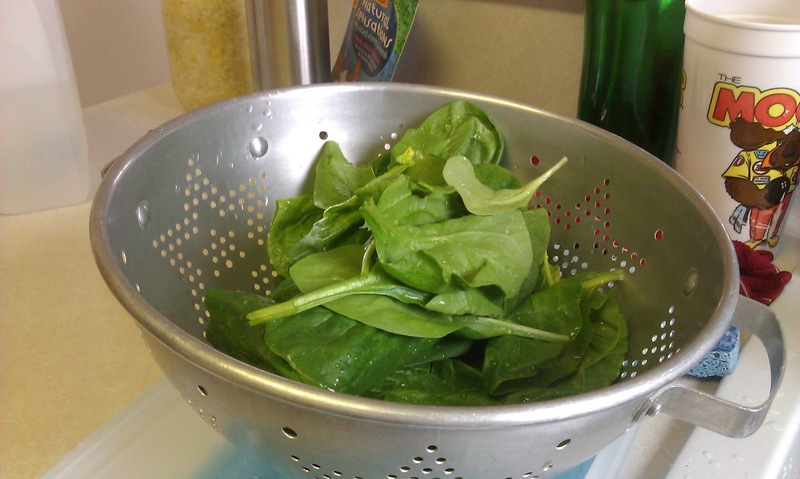 Let that saute for a bout a minute and then add the spinach and saute until it’s just cooked and wilted. Season with the salt and pepper. Turn heat to low. Add cream cheese to skillet and stir until it is melted. Stir in the yogurt and beans. Slice the potatoes in half lengthwise, scoop out most of the potato with a spoon, and add it to the skillet. Stir to combine, and taste and add seasoning if necessary. 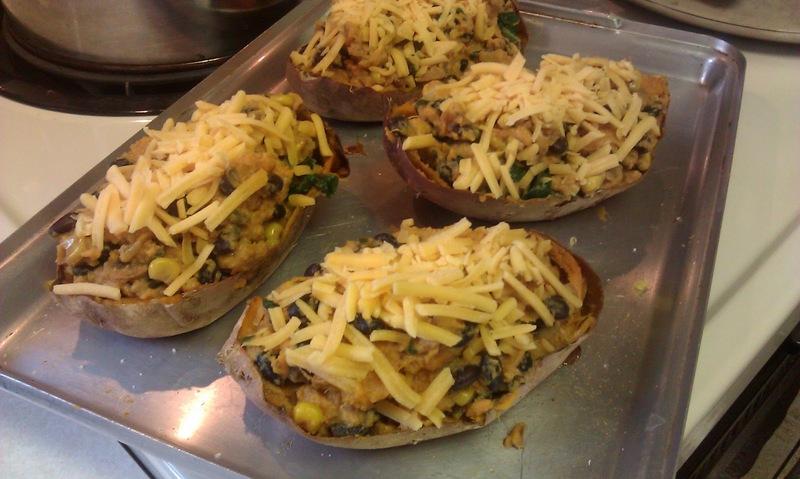 Evenly spoon the filling back into the sweet potato boats and top with shredded cheese. Turn the oven to broil and slide the potatoes back in until the cheese is just lightly browned and bubbly, about 3 minutes. Garnish with a shake of Paprika and Parsley and serve immediately! I didn't actually pay attention to how long I sauteed the onions, garlic, peppers, etc. Just added the onion to the skillet, cooked it a bit, then started adding all the other ingredients. It's basically what looks good to you. It does look good, doesn't it? Oh, and I only used 1/2 of the jalapeno because I thought the whole thing would make it too spicy for my husband, but it didn't turn out spicy at all, so I'd suggest sticking with the whole thing. Or using the pickled ones like Beth did in hers. 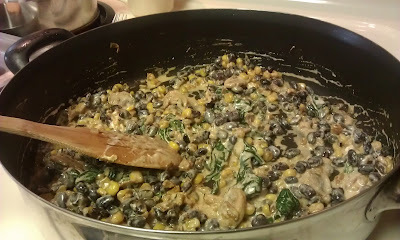 And then I added the cream cheese - the heat from the skillet melted it very nicely - and the yogurt and beans. Doesn't this look yummy? For some reason, I didn't taste it, but it certainly smelled amazing. I'm thinking this mixture right here would be perfect for something. I'm not sure what yet - over pasta? With some pasta mixed in? Spread over tortilla chips, topped with shredded cheese and baked like nachos? Yeah, there's something... I should've tasted it, though, because I forgot to add the salt and pepper like I was supposed to. My potatoes were so done that I had to be careful not to scoop all of the flesh out of them, leaving nothing but the peel behind. I put as much filling as I could into the scooped out potato skins, and I had some left over, so I saved that for later. It was great warmed up and wrapped in a tortilla and also just scooped up with tortilla chips. This is good filling! I added some salt right before I sprinkled the cheese on - because I forgot to taste and add it earlier. 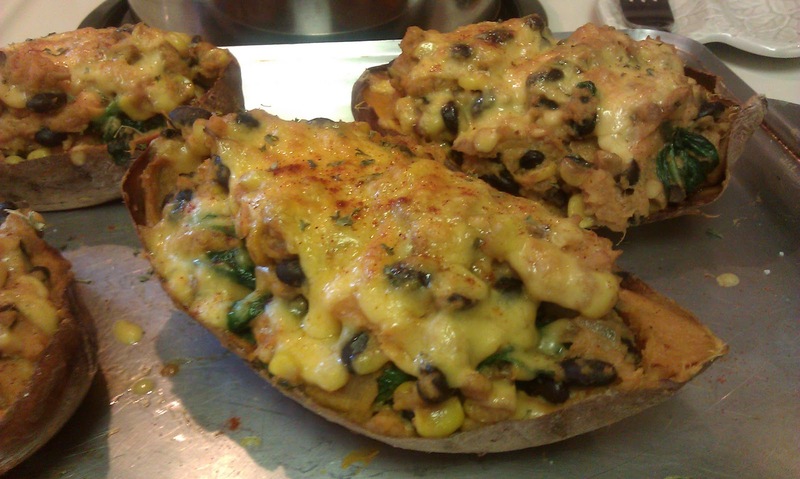 The filling is already hot, so it doesn't take long to melt the cheese under the broiler, and they're ready to eat. These things are really filling. We had one potato half with some salad, and that was enough! That means we got to enjoy them for another meal. I just put them into a Corningware dish and baked them, with the lid on, for 20 to 30 minutes at 350°. Perfect! My husband just ate the filling both times and threw the potato skin away. I ate the skin, and I liked it much better after it was baked. It kind of crisped up a bit. I'm thinking that next time I make these I'm going to bake them until the cheese is melted and browned, instead of broiling. Either that or scoop absolutely all of the potato out of the skins, mix the filling, and put it into some kind of baking dish to broil and melt the cheese. So many yummy flavors. I am definitely making these again! And trying some of those other recipes from Beth's blog. Be sure to check it out for yourself.